A return cab ride journey aboard ex London Underground Stock of South West Trains from Ryde Pier Head to Shanklin on the Isle of Wight via Ryde Esplanade, Brading & Sandown. Ryde Esplanade, Ryde St Johns Road, Smallbrook Junction, Brading, Sandown & Lake terminating at Shanklin then the return journey. 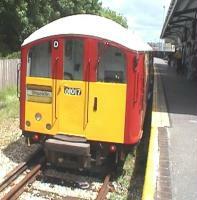 This cab ride travels along the 8½ mile railway on the Isle of Wight.